I had this little idea a few years back to gather some of my favourite clients who were regularly attending workshops I ran and turn them into a mastermind group. We met up – and still meet up – around once a month, and I give them training on social media, blogging and small business topics, I help them out (and they help each other out) with any challenges they’re facing, and I keep them accountable for tasks they want to complete before we see each other again. Not quite sure what a mastermind group is? Read this post to see a summary of what we do. I’m so pleased that this little idea turned into something bigger. Not only are three of the original four members of the first mastermind group still coming along, but this year I’ve been running a total of five groups spread across different times of the week. And it is easily some of the very most rewarding work I do! 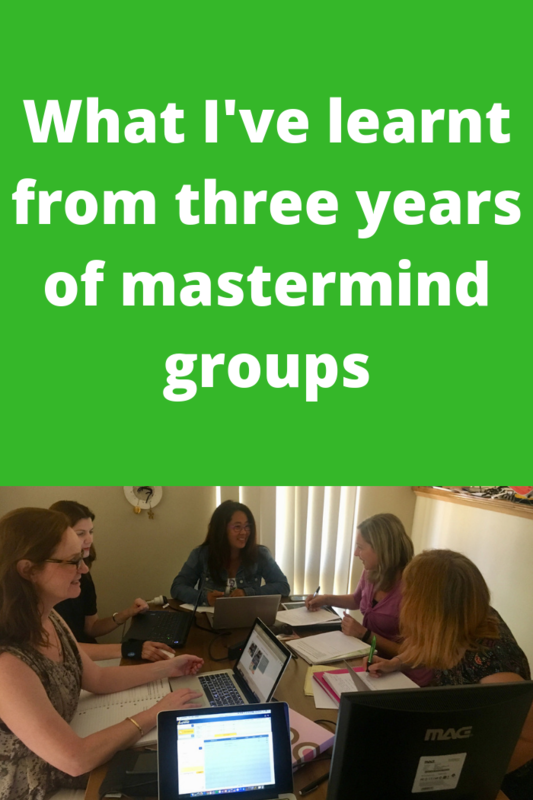 Running these mastermind groups has not only helped a couple of dozen of my most favourite clients, but it’s also taught me a lot – enough that it’s time to write a post about what I’ve learnt from three years of running mastermind groups. This comes as no big surprise to me, as I am someone who needs a lot of external accountability to really get things done (making me perhaps somewhat unsuited to being a small business owner … but I get there! ), but it is comforting to know I am far from being alone. People who fit this “Obliger” profile really benefit from the external accountability of promising me (and their group) that they’ll complete a task, but it’s not just them – accountability for tasks keeps everyone on track. Well, nearly everyone, but I am sometimes growling a little at people who don’t do their homework …! If you need to learn about social media and blogging, you’ll often come to me for a one-day workshop. These are great, I have heaps of fun teaching them, and people learn a lot, but it’s not always easy to go away and apply all of this. In my mastermind groups, we just learn small aspects of a platform or skill each time, then go away and practise, knowing that at any time my participants can ask questions in our Facebook groups to get help or can ask more when they come back the following month. I had hoped this system would make it easier for people to upskill more effectively, and it has really worked. Yay! Solo business owners need people – from different niches! Like me, most of my masterminders spend a lot of time in a home office and don’t often get to talk to other people who “get” what they do. Coming along to a mastermind group is a great way to deal with this problem. My first group were all writers and artists, had known each other through workshops already, and had plenty in common, so I wasn’t surprised that they got along and quickly started doing even more to support each other (for a long time they’d meet up in a cafe on Tuesday afternoons to sit together and write in a session they aptly named “Shut up and blog”!). However, since them, my groups have had much more diverse participants. The first time I was worried about how it would go, but I have since learnt that these groups of four or five people bond incredibly well no matter what their industry. I’m always excited to see how much they support each other online, how many good ideas they have for each other’s businesses, and how over time they end up as firm friends. Warms my heart! I have to pinch myself regularly because I can barely believe I have the privilege of working with these awesome people. From authors who publish the most incredible books that hold pride of place on my bookshelf, through incredible artists whose talents astound me, to people like Maureen Helen who at the young age of 80 still learn and apply so much about social media and blogging and just inspire me constantly – I’m so lucky! I look forward immensely to the mastermind sessions – having just had a longer break than usual thanks to my Cambodia/Vietnam journey I was so excited when my first group appeared on Tuesday morning – and I hope my participants know that, even if I’m harassing them about doing their homework, I still love them all dearly and am so happy to be able to contribute something tiny towards their success. Oh Maureen – you do much more than keep up, you lead the way! I’m really glad you joined and I love working with you and your group. Thank YOU!